Some of the most impressive marketing systems I’ve seen have been developed for mobile phone marketing, especially for companies that sell prepaid phones. I don’t know why: probably some combination of intense competition, easy switching when customers have no subscription, location as a clear indicator of varying needs, immediately measurable financial impact, and lack of legacy constraints in a new industry. Many of these systems have developed outside the United States, since prepaid phones have a smaller market share here than elsewhere. Flytxt is a good example. Founded in India in 2008, its original clients were South Asian and African companies whose primary product was text messaging. The company has since expanded in all directions: it has clients in 50+ countries including South America and Europe plus a beachhead in the U.S.; its phone clients sell many more products than text; it has a smattering of clients in financial services and manufacturing; and it has corporate offices in Dubai and headquarters in the Netherlands. The product itself is equally sprawling. Its architecture spans what I usually call the data, decision, and delivery layers, although Flytxt uses different language. The foundation (data) layer includes data ingestion from batch and real-time sources with support for structured, semi-structured and unstructured data, data preparation including deterministic identity stitching, and a Hadoop-based data store. The intelligence (decision) layer provides rules, recommendations, visualization, packaged and custom analytics, and reporting. The application (delivery) layer supports inbound and outbound campaigns, a mobile app, and an ad server for clients who want to sell ads on their own Web sites. To be a little more precise, Flytxt’s application layer uses API connectors to send messages to actual delivery systems such as Web sites and email engines. Most enterprises prefer this approach because they have sophisticated delivery systems in place and use them for other purposes beyond marketing messaging. And while we’re being precise: Flytxt isn’t a Customer Data Platform because it doesn’t give external systems direct access its unified customer data store. But it does provide APIs to extract reports and selected data elements and can build custom connectors as needed. So it could probably pass as a CDP for most purposes. Given the breadth of Flytxt’s features, you might expect the individual features to be relatively shallow. Not so. The system has advanced capabilities throughout. Examples include anonymizing personally identifiable information before sharing customer data; multiple language versions attached to the one offer; rewards linked to offers; contact frequency limits by channel across all campaigns; rule- and machine learning-based recommendations; six standard predictive models plus tools to create custom models; automated control groups in outbound campaigns; real-time event-based program triggers; and a mobile app with customer support, account management, chat, personalization, and transaction capabilities. The roadmap is also impressive, including automated segment discovery and autonomous agents to find next best actions. What particularly caught my eye was Flytxt’s ability to integrate context with offer selection. Real-time programs are connected to touchpoints such as Web site. When a customer appears, Flytxtidentifies the customer, looks up her history and segment data, and infers intent from the current behavior and context (such as location), and returns the appropriate offer for the current situation. The offer and message can be further personalized based on customer data. This ability to tailor behaviors to the current context is critical for reacting to customer needs and taking advantage of the opportunities those needs create. It’s not unique to Flytxt but it's also not standard among customer interaction systems. Many systems could probably achieve similar outcomes by applying standard offer arbitration techniques, which generally define the available offers in a particular situation and pick the highest value offer for the current customer. But explicitly relating the choice to context strikes me as an improvement because it clarifies what marketers should consider in setting up their rules. On the other hand, Flytxt doesn't place its programs or offers into the larger context of the customer lifecycle. This means its up to marketers to manually ensure that messages reflect consistent treatment based on the customer's lifecycle stage. Then again, few other products do this either...although I believe that will change fairly soon as the need for the lifecycle framework becomes more apparent. Flytxt currently has more than 100 enterprise clients. Pricing is based on number of customers, revenue-gain sharing, or both. Starting price is around $300,000 per year and can reach several million dollars. “I used to hate POCs (Proof of Concepts) but now I love them,” a Customer Data Platform vendor told me recently. “We do POCs all the time,” another said when I raised the possibility on behalf of a client. Two comments could be a coincidence. (Three make a Trend.) But, as the first vendor indicated, POCs have traditionally been something vendors really disliked. So even the possibility that they’ve become more tolerable is worth exploring. We should start by defining the term. Proof of Concept is a demonstration that something is possible. In technology in general, the POC is usually an experimental system that performs a critical function that had not previously been achieved. A similar definition applies to software development. In the context of marketing systems, though, a POC is usually not so much an experiment as a partial implementation of an existing product. What's being proven is the system's ability to execute key functions on the buyer's own data and/or systems. The distinction is subtle but important because it puts the focus on meeting the client's needs. Of course, software buyers have always watched system demonstrations. Savvy buyers have insisted that demonstrations execute scenarios based on their own business processes. A carefully crafted set of scenarios can give a clear picture of how well a system does what the client wants. Scenarios are especially instructive if the user can operate the system herself instead of just watching a salesperson. What scenarios don’t illustrate is loading a buyer’s data into the system or the preparation needed to make that data usable. That’s where the POC comes in. The cost of loading client data was the reason most vendors disliked POCs. Back in the day, it required detailed analysis of the source data and hand-tuning of the transformation processes to put the data into the vendor’s database. Today this is much easier because source systems are usually more accessible and marketing systems – at least if they’re Customer Data Platforms – have features that make transformation and mapping much more efficient. The ultimate example of easier data loads is the one-click connection between many marketing automation and CRM “platforms” and applications that are pre-integrated with those platforms. The simplicity is possible because the platforms and the apps are cloud-based, Software as a Service products. This means there are no custom implementations or client-run systems to connect. Effortless connections let many vendors to offer free trials, since little or no vendor labor is involved in loading a client’s data. In fact, free trials are problematic precisely because so little work goes into setting them up. Some buyers are diligent about testing their free trial system and get real value from the experience. But many set up a free trial and then don't use it, or use it briefly without putting in the effort to learn how the system works. This means that all but the simplest products don’t get a meaningful test and users often underestimate the value of a system because they haven’t learned what it can do. POCs are not quite the same as free trials because they require more effort from the vendor to set up. In return, most vendors will require a corresponding effort from the buyer to test the POC system. On balance that’s a good thing since it ensures that both parties will learn from the project. Should a POC be part of every vendor selection process? Not at all. POCs answer some important questions, including how easily the vendor can load source data and what it’s like to use the system with your own data. A POC makes sense when those are critical uncertainties. But it’s also possible to answer some of those questions without a POC, based on reviews of system documentation, demonstrations, and scenarios. If a POC can’t add significant new information, it’s not worth the time and trouble. Also remember that the POC loads only a subset of the buyer’s data. This means it won't show how the system handles other important tasks including matching customer identities across systems, resolving conflicts between data from different sources, and aggregating data from multiple systems. Nor will working with sample data resolve questions about scalability, speed, and change management. The POC probably won’t include fine-tuning of data structures such as summary views and derived variables, even though these can greatly impact performance. Nor will it test advanced features related to data access by external systems. Answering those sorts of questions requires a more extensive implementation. This can be done with a pilot project or during initial phases of a production installation. Buyers with serious concerns about such requirements should insist on this sort of testing or negotiate contracts with performance guarantees to ensure they’re not stuck with an inadequate solution. POCs have their downsides as well. They require time and effort from buyers, extend the purchasing process, and may limit how many systems are considered in depth. They also favor systems that are easy to deploy and learn, even though such systems might lack the sophistication or depth of features that will ultimately be more important for success. In short, POCs are not right for everyone. But it’s good to know they’re more available than before. Keep them in mind as an option when you have questions that a POC is equipped to answer. Wizaly is a relatively new entrant in the field of algorithmic revenue attribution – a function that will be essential for guiding artificial-intelligence-driven marketing of the future. Let’s take a look at what they do. First a bit of background: Wizaly is a spin-off of Paris-based performance marketing agency ESV Digital (formerly eSearchVision). The agency’s performance-based perspective meant it needed to optimize spend across the entire customer journey, not simply use first- or last-click attribution approaches which ignore intermediate steps on the path to purchase. Wizaly grew out of this need. Wizaly’s basic approach to attribution is to assemble a history of all messages seen by each customer, classify customers based on the channels they saw, compare results of customers whose experience differs by just one channel, and attribute any difference in results to that channel For example, one group of customers might have seen messages in paid search, organic search, and social; another might have seen messages in those channels plus display retargeting. Any difference in performance would be attributed to display retargeting. This is a simplified description; Wizaly is also aware of other attributes such as the profiles of different customers, traffic sources, Web site engagement, location, browser type, etc. It apparently factors some or all of these into its analysis to ensure it is comparing performance of otherwise-similar customers. It definitely lets users analyze results based on these variables so they can form their own judgements. Wizaly gets its data primarily from pixels it places on ads and Web pages. These drop cookies to track customers over time and can track ads that are seen, even if they’re not clicked, as well as detailed Web site behaviors. The system can incorporate television through an integration with Realytics, which correlates Web traffic with when TV ads are shown. It can import ad costs and ingest offline purchases to use in measuring results. The system can stitch together customer identities using known identifiers. It can also do some probabilistic matching based on behaviors and connection data and will supplement this with data from third-party cross device matching specialists. Reports include detailed traffic analysis, based on the various attributes the system collects; estimates of the importance and effectiveness of each channel; and recommended media allocations to maximize the value from ad spending. The system doesn't analyze the impact of message or channel sequence, compare the effectiveness of different messages, or estimate the impact of messages on long-term customer outcomes. As previously mentioned, it has a partial blindspot for mobile – a major concern, given how important mobile has become – and other gaps for offline channels and results. These are problems for most algorithmic attribution products, not just Wizaly. One definite advantage of Wizaly is price: at $5,000 to $15,000 per month, it is generally cheaper than better-known competitors. Pricing is based on traffic monitored and data stored. The company was spun off from ESV Digital in 2016 and currently has close to 50 clients worldwide. Now, the manager can also deal with more-or-less infinite complexity. This means we no longer need campaigns and segments and can truly orchestrate treatments for each customer as an individual. 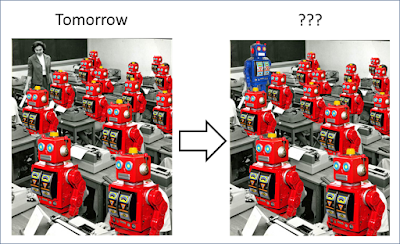 In theory, the robot manager could order her robot assistants to create custom messages and offers in each situation, based on the current context and past behaviors of the individual human involved. In essence, each customer has a personal robot following her around, figuring out what’s best for her alone, and then calling on the other robots to make it happen. Whether that's a paradise or nightmare is beyond the scope of this discussion. As I've become less concerned about the challenges of robot communication, I've grown more concerned about robots making the right decisions. In other words, the manager robot needs a way to choose what the specialist robots will work on so they are doing the most productive tasks. The choices must be based on estimating the value of different options. Creating such estimates is the job of revenue attribution. So it turns out that accurate attribution is a critical requirement for AI-based orchestration. Moreover, this type of attribution applies primarily to near-term events such as purchases or some other easily measured conversion. Guiding lifetime journey orchestration requires something more subtle. This will almost surely be based on a simulation model or state-based framework describing influences on buyer behavior over time. But whatever the weaknesses of current algorithmic attribution methods, they are at least based on actual behaviors and can be improved over time. And even if they're not dead-on accurate, they should be directionally correct. That’s good enough to give the AI manager something to work with as it tells the specialist AIs what to do next. Indeed, an AI manager that's orchestrating contacts for each individual will have many opportunities to conduct rigorous attribution experiments, potentially improving attribution accuracy by a huge factor. And that's exactly the point. AI managers will rely on attribution to measure the success of their efforts and thus to drive future decisions. This changes attribution from an esoteric specialty to a core enabling technology for AI-driven marketing. Given the current state of attribution, there's an urgent need for marketers to pay more attention and for vendors to improve their techniques. So if you haven’t given attribution much thought recently, it’s a good time to start.